White sauce is one of the basic sauces used in Italian cuisine. It is known throughout the world by its French name Béchamel; in fact, it is one of the five mother sauces of French cuisine. It is said the French were introduced to this sauce by the Italians. 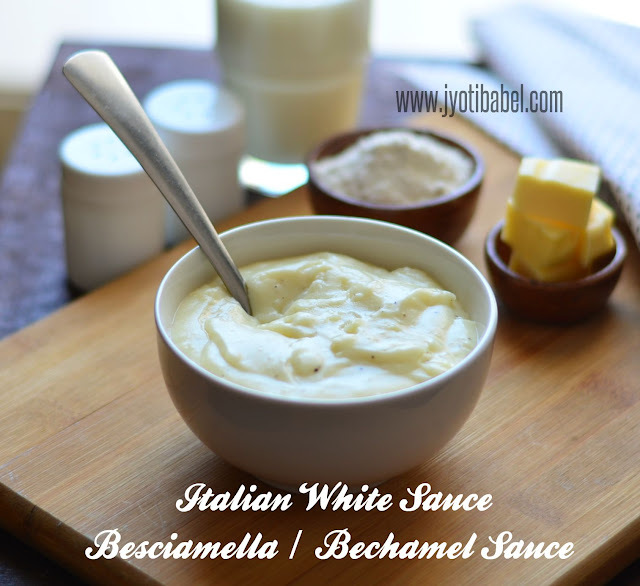 In Italy, white sauce is known as besciamella. It is used in making gratin and many types of pasta like lasagna, cannelloni, etc. In order to make the béchamel sauce, a roux consisting of equal parts of flour and butter need to be prepared first. To it, hot milk is added and cooked to create a creamy sauce. The roux in béchamel sauce should not be cooked much as it must not get brown. The quantity of flour and butter per cup of milk can vary slightly depending on how think or thick sauce you need. 2 tbsp of flour per cup of milk will give you a medium thick sauce and 3tbsp flour per cup of milk will give you a creamier sauce. As the sauce gets cold, it can thicken further. Just little more milk and whisk it to get the consistency right. 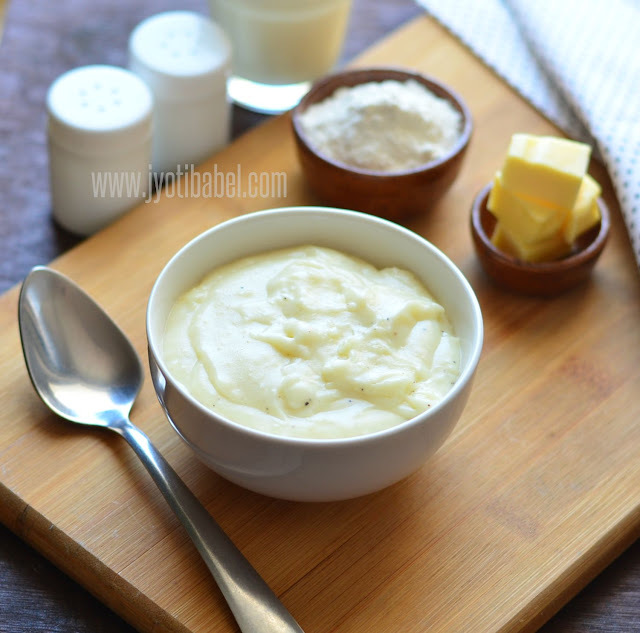 Let’s check out the recipe for Italian White sauce now. 1. Heat a pan over medium-low heat and add butter to it. Add the flour and whisk for 2 minutes. Do not let the mixture to brown. 2. Gradually add hot milk and keep whisking constantly. Add salt and pepper to taste and keep stirring constantly. In about 10-15 minutes the sauce will have the consistency of thick cream. 3. Take it off heat and use it in pasta as needed. 1. It is best to use the sauce immediately. If you unable to do so, you may have to add a little more milk later to get the consistency of the sauce right as it might get thicker. 2. I sometimes use garlic and herb butter and a heaped spoon of sugar in this sauce for a slightly different taste. 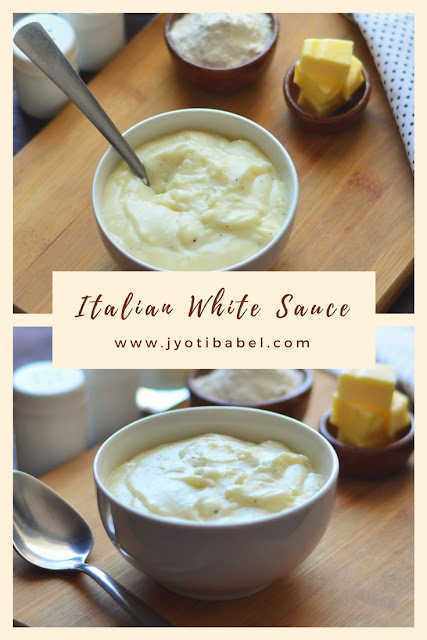 This Italian White Sauce recipe is my entry for BM 86 Week 3 Day #3 under the theme 'Italian Sauces You Should Master'. For Day #1 & Day #2 under the theme, I had posted Basil Walnut Pesto and Homemade Pizza Sauce respectively. Very well explained . This is a sauce which goes into my most bakes , though I no longer use apf and substitute it with wheat flour . The sauce is smooth and silky. A good alternative to tomato based sauces for pasta. One of the classic sauce, and a prefect sauce to make some delightful pasta dishes with it. My kids favourite sauce. Better to keep white sauce handy when we have kids in home.. Great share..
wow I love this sauce in my pastas , Your sauce looks so smooth and rich .. Wonderfully explained even a person who haven't enter kitchen could follow your recipe and nail it ..
Versatile and its my kiddo's favorite sauce too. Love it. White sauce is the base of many Italian recipes and you have made it perfectly. one of the favorite sauce! perfectly done! i bet it is every kid's favorite!!! Nicely explained. This is one of the simplest yet most flavorful sauces. This is my kids' favourite sauce..I love adding bits of capsicum and corn and they will just gorge on it!Yours looks delicious.